So you’re thinking about going to gymnastics camp this summer but haven’t had a chance to decide on which one. Don’t worry. We’ve got you covered! 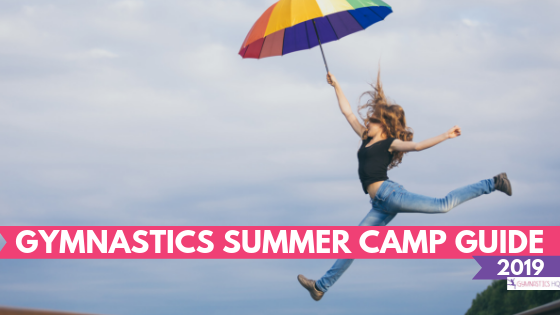 We put together a quick Gymnastics Summer Camp Guide to help you get all the information in one place so you can make an informed decision about whether going to gymnastics camp is the right decision for you. There are a few things to consider when deciding on a gymnastics camp, including whether you want to go away to sleepaway camp, go to 3-day collegiate camp, do a weekend clinic, or stick to your local gymnastics center’s camp. Below we compare the most popular types of gymnastics summer camps to help you decide. Going to gymnastics sleepaway camp is a big decision especially for younger gymnasts. 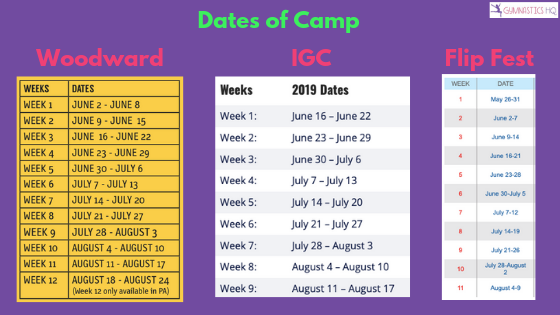 Below we’ve broken down some of the differences between the more popular sleepaway camps in the U.S. which include International Gymnastics Camp (IGC) located in Stroudsburg, PA, Camp Woodward located in Woodward, PA (and its other location Woodward West located in Tehachapi, CA), and Flip Fest located in Crossville, TN. All of the sleepaway camps offer weekly sessions that run from Sunday to Saturday. Also, depending on where the camp is located, the starting and end dates may vary. 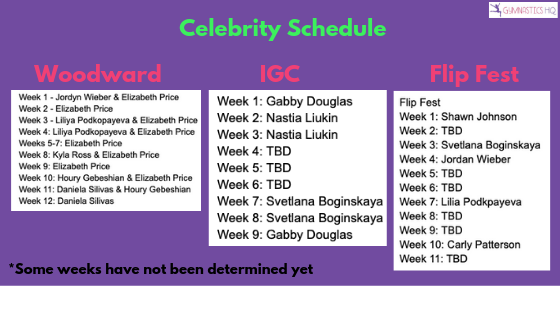 For example, the first week of camp at Flip Fest starts on May 26th while International Gymnastics Camp starts on June 16th. Depending on your school calendar you might need an earlier session or need to attend one of the later weeks of camp. This year Woodward PA is also offering Mini Sessions for campers ages 7-10. The week is shortened from Sunday to Wednesday or Wednesday to Saturday. It’s only available during two weeks of the summer including June 2-8th and August 18-24th. Going to gymnastics sleepaway camp is an investment with some sleepaway camps being pricier than others. Below we’ve listed out the cost of each of these camps. You can see gymnastics sleepaway camp can run from $950-$1445 per week depending on the camp. The new Half-Week camps at Woodward PA cost $779 for the shortened week. Woodward West runs slightly lower than Woodward PA with rates ranging from $1129-$1329. Some gymnastics sleepaway camps offer discounts if you sign up for multiple sessions or have siblings attend at the same time. Woodward PA/Woodward West: Save $100 when a sibling enrolls in camp. Save $100 on any additional week with promo code “STAY2019”. Team discounts available as well. A $300 deposit is due at time of registration. They offer a Flex-Pay program where you can set up payments for camp as long as camp is paid in full 30 days prior to starting. 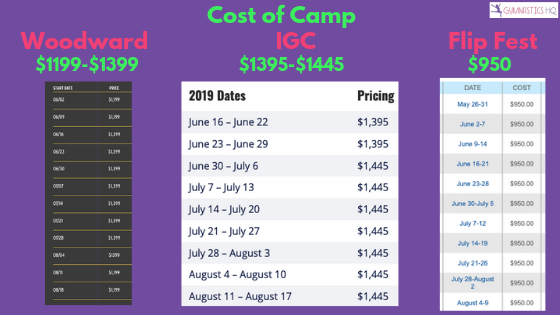 IGC: Early bird discounts have already expired for this year although typically they offer $50-$150 discounts for registering early. If you register after April 1st, payment is due in full. Flip Fest: $50 off for each additional week of camp. $50 off for more than one child in the same family attending. A $200 deposit is due per session at time of registration. Payment in full is required by May 1st. Some gymnastics sleepaway camps are gymnastics specific, meaning there are no other sports camps offered at their camp, while others have a mix of different sports camps on campus. In addition, some gymnastics sleepaway camps are known for being geared towards gymnastics training with fewer recreational activities while others have a bigger mix of gymnastics and recreation. Depending on what kind of experience you want, your choices will vary. At Woodward there is a morning, afternoon, and evening instruction session but according to campers only one session is required and the other sessions are optional. Therefore you have more flexibility with your schedule and can spend more time doing recreational activities. At IGC, campers get 6 mandatory coached rotations throughout the day with an optional evening session. The focus is more on gymnastics training than recreational activities although campers still have time to do fun activities. Flip Fest has two training sessions during the day with one open gym session in the evening. According to their website, they offer a nice balance between gymnastics instruction and recreational activities. A cool part about gymnastics summer camp is that most sleepaway camps have Olympians on staff throughout the summer or if not on staff, then they pop in during one or two weeks of camp. 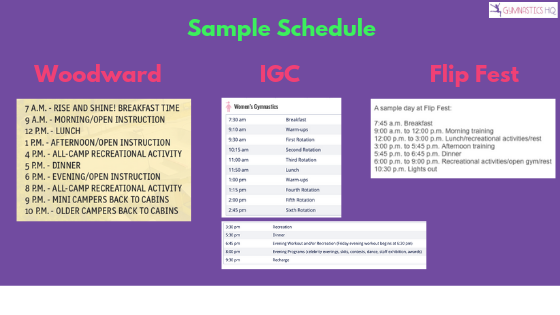 If your child has a favorite gymnast who is appearing at camp, then you might schedule her to go to camp during that week. Woodward West – Betty Okino and Mohini Bhardwaj will make appearances throughout the summer but exact weeks have yet to be determined. IGC – Campers are housed by age and gender in fully equipped chalet-style cabins that are air conditioned and include private bathroom facilities. Two counselors live in each cabin and are there to make sure campers have a great experience. Woodward – Campers share an air-conditioned cabin with other kids their same age and gender. Most cabins have an adjacent bath. Cabins are supervised by a live-in counselor. For younger campers (ages 7-9) there are mini cabins supervised by a live-in parent. These live-in counselors are volunteer parents of a camper and are there to assist the younger campers throughout the day. Flip Fest – Campers are housed by age in air-conditioned cabins separated by gender. Each cabin has its own bathroom. Two counselors live in each cabin. All teammates are automatically roomed together, regardless of age, unless specified otherwise. There are up to 16 campers in one side of a cabin (with each cabin having 2 sides). All camps have bunk-bed style beds in the cabins and require campers to bring their own sheets, pillows, and sleeping bags. IGC – Dining occurs buffet-style in the International Cafe. Food includes options such as fresh fruit, yogurt, oatmeal, bagels, eggs, meats, potatoes, french toast/pancakes/waffles, a variety of cold cereals, as well as milk, juice, and hot chocolate. Lunch and dinner buffet includes a full course hot buffet menu as well as soup, a full salad bar, a build-your-own-wrap bar, and fresh fruit. Vegetarian choices are available and no nut products are used. Woodward PA & West – The cafeteria offers multiple options during every meal including a hot meal option and fresh fruit/salad bar. The cafeteria is also equipped with a cereal bar, peanut butter and jelly bar, pasta bar, soup of the day, and taco bar. Flip Fest – All meals are prepared fresh daily. Fruit is offered at every meal including a salad bar at lunch/dinner. Options include tacos, chicken nuggets, and a sandwich bar, to name a few. In addition, all of the camps offer alternate dining options for a fee. You can load up a camp card with money prior to starting camp so that gymnasts can purchase food at these other dining options. For example, Woodward PA offers the Beijing Grill, Fajita Grill, and Burger Grill which you can eat at for an additional fee. IGC – Recreation at IGC includes things like a ropes course and zip line (Scary Aerie), lakes and pools, karaoke, water slides, laser tag, and camp fires. Woodward – According to their website: After mandatory daily instruction, campers can either continue to work on their skills at the gym or take it easy and try something new. From relaxing by a pool, to taking a try at GoCarts, to designing your own skateboard or bow, to hanging-out by a campfire, it’s impossible to not have fun at camp. Flip Fest – According to their website: All our great lake activities begin on the sandy beach of Lake Frances. Campers may lie on the beach, swim, canoe or ride a tube behind one of the Flip Fest jet skis. Other camp activities include fishing, sand volleyball, laser tag, the famous “Monday night camp dance” with a live DJ, skit night, dodge ball, spud, tie dye, karaoke, blob, basketball court, s’mores, the Flip Fest ultimate obstacle course, arts and crafts and camper and staff games with the greatest camp leader, Randy Parrish. Some camps charge extra fees for activities such as jet skiing and horse back riding. In addition, there are camp stores or “canteens” where gymnasts can purchase merchandise or buy snacks so be prepared to load up extra money on a camp card when you arrive. IGC is the only gymnastics facility in the world with 5 separate gyms, including the Olympic Gym, Vault & Floor Gym, Beam Gym, Bars Gym, and Dance Gym. IGC was created in 1971 by founder Bruno Klaus who still makes appearances to this day doing giants at Friday night’s staff show (he’s 81 years old!). According to our gymnasts, campers are more supervised than at the other camps which might be a better choice if you have younger gymnasts. Also, cell phones, cameras, laptops, tablets, mp3s, iwatches, and all other electronic devices are not allowed at camp. This might be tough for campers who want to communicate often with their parents. Phone calls are allowed, however, during open session through the camp phone line. We were also told there are large hills on the grounds that gymnasts have to walk up which our gymnasts weren’t such fans of! Woodward PA, created in 1970, has gyms that are in barns and there is more open space throughout the camp. There is a Beam gym, Open gym, and Pit gym. Because there are other sports camps going on at the same time gymnasts will see and potentially interact with campers from other sports, including campers in the BMX/Skateboarding camps. According to some parents, campers are less supervised throughout the camp day which might be problematic for younger gymnasts. Because gymnasts are only required to go to one gymnastics training during the day they have more room to try different recreational activities throughout the day. Flip Fest is owned by former Olympians John Roethlisberger and John Macready and was established in 2005. It allows only 260 campers per week so it sells out quickly. Right now the only available weeks for girls are Weeks 1-3 and 10-11. All of these camps are co-ed so expect to see male gymnasts training there as well although housing is always separated by gender. Also, it’s important to note that it’s common at camp for gymnasts to be heavily spotted to prevent injuries. While learning new skills might be your goal, the purpose of most sleepaway gymnastics camps is to refine the basics. At the start of camp, gymnasts go through a quick evaluation of skills so they can be grouped into different skill-level groups. It’s not uncommon for gymnasts to be placed in a lower level group than expected which can be disappointing to some gymnasts. Again, safety is a big priority at camps and is one of the reasons why this occurs. Maybe you have a younger camper who isn’t ready for sleepaway camp or you have an older gymnast who is looking at colleges? Check out some of these other options for your gymnasts if sleepaway camp is not the right choice. If you’re thinking of doing college gymnastics or want a gymnastics-focused camp then attending camp at a college might be a good option for you. All of the big players in college gymnastics host summer camps including University of Georgia, University of Florida, LSU, University of Alabama, University of Kentucky, University of Oklahoma, UCLA, University of Utah, and University of Michigan (to name a few). Most of these camps are open to gymnasts who are ages 8 and older. Some only offer a commuter option while others give an option of staying overnight in the dorms on campus (typically for gymnasts who meet a certain age requirement which is often age 12). Most have designated High Performance camps for higher level gymnasts (Levels 6 or 7 and up) so be sure to check their schedule to see all the options. They all offer 3 day camps. Prices range from about $495-$650+ for the 3 days. Most of the time lunch and dinner are provided while gymnasts provide their own snacks. A typical day runs from 9am-6pm and sometimes there is an evening rec session at the pool, depending on the college. In addition, most of the camp dates are limited to June and sometimes a week or two in July so plan accordingly. The benefit of a college camp is being trained by collegiate coaches, former and current collegiate gymnasts, as well as special guests. If college gymnastics is on your gymnast’s radar, she’ll be able to showcase her skills in a noncompetitive environment. It also gives the gymnast a chance to check out the coaching staff’s style to see if they would be a good fit for her. If your gymnast dorms overnight then she’ll see the college dorms and get a feel for college life. College gymnastics camps are a great option for older gymnasts considering college gymnastics. But younger gymnasts can benefit, too, from the high level training and exposure to different coaching styles. Run by Olympian Samantha Peszek, Beam Queen Bootcamp is a 2-day clinic that travels across the country. The focus is on feeling more comfortable and confident on beam! While gymnasts won’t be on beam the entire time, all of their rotations focus on getting better mentally and physically for beam. The clinics run from 2-6pm on Saturday and Sunday and cost $295. There are compulsory-specific clinics as well as optional-specific clinics depending on your level. Right now there are clinics scheduled in Colorado, Washington, Pennsylvania, Florida, Indiana, California, and Maine. Check out the schedule to see if the clinic is coming to a city near you. Let’s not forget going to your local gymnastics center for a half-day/full day camp. While you won’t get the experience of a sleepaway camp, your gymnast will still get a chance to work on her skills in a fun environment. Plus, the cost of day camps are significantly cheaper than sleepaway camp and you can stay close to home. It might not be the best option for higher level gymnasts, but it can keep your beginner/intermediate gymnast in the gym and satisfied for the summer. Many day camps offer theme weeks as well as extras such as blow-up bouncy slides and arts and crafts. A typical gymnastics day camp might also offer a snack and serve pizza for lunch. Depending on what you are looking for in a camp, it’s possible to find the right option to meet your gymnast’s needs this summer. If you’re looking for a more traditional “camp” experience with fun outdoor recreational activities then sleepaway gymnastics camp might be the right choice. If your gymnast is younger or less serious about gymnastics, then a day camp might be the better option at a more affordable price. If your gymnast is looking to hone in on skills or get a feel for college-level gymnastics then a college camp might be the best fit. Have you been to any of the camps we mentioned? What did you like or not like about them? Share with us below! I’ve done the gymnastics camp at DU for three years and we get to work with gymnasts on the team as well as their coaches. For 1/2 of the day, we rotate through the events and for the other half we get to go to Yoga and other activities including dance and nutrition. That sounds like so much fun! Thanks for sharing! We did Northern Illinois Universities 2 day camp last year and Amelia had a blast. She got her first taste of flyaways and has been crazy about bars since!! We are checking out University of Illinois camp this year and I wish we could have gotten into Beam Queen camp. I can’t believe how fast Indiana sold out!! We want to do flip fest but since Amelia is only 8 the shortened college camp seemed like a good start!